Earnings from opium production in Afghanistan soared by 133 per cent last year to about $1.4 billion, or about one-tenth of the country's GDP, according to a United Nations report received Friday. The U.N. Office on Drugs and Crime said the price rise was due to a plant disease that wiped out much of the opium crop in 2010. Although yields returned to pre-blight levels in 2011, the prices have remained high, the survey said. Definitive statistics are hard to obtain in Afghanistan, but the survey said the value of the crop may now be the equivalent of nine percent of the country's GDP. 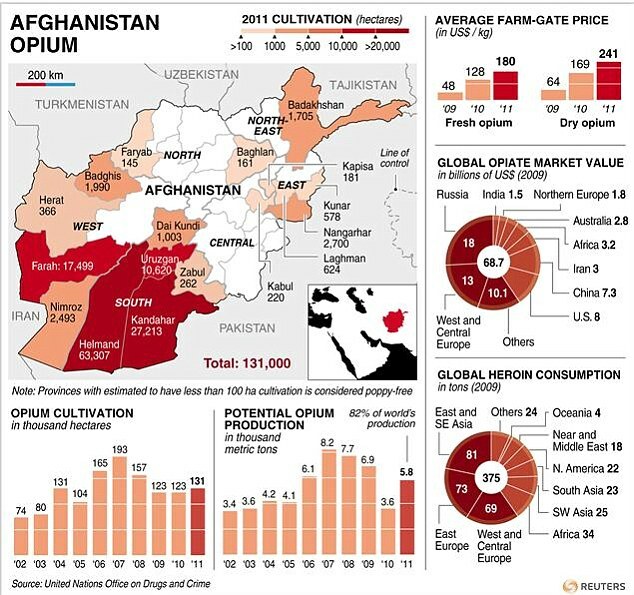 'Opium is therefore a significant part of the Afghan economy and provides considerable funding to the insurgency and fuels corruption,' said Yury Fedotov, director of the Vienna-based agency. Earnings from opium finance weapons and equipment purchases for the Taliban. Afghanistan provides about 90 percent of the world's opium, the raw ingredient for heroin.